You can change the bitmap drawing resolution at the scene or the drawing level—see About Bitmap Brushes. Change the bitmap resolution settings and click OK. The bitmap resolution settings at the scene level affects newly created bitmap art layers. Scene Resolution This is the scene resolution preset name and size in pixels. Width This is the width of the resolution for the bitmap that will be created. This is not the actual size of the bitmap. 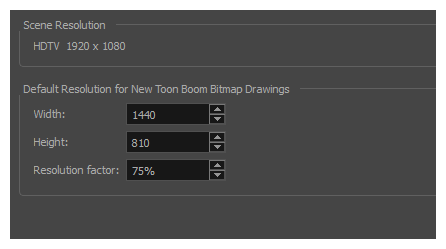 TVG drawings (Toon Boom drawing native format) have an infinite size. Bitmap TVGs are composed of small tiles. Therefore it does not mean that because you have artwork at the four corners of your camera frame or even quite far outside of your drawing that your bitmap image will be very large and heavy. By default, it is set to the same width as the scene resolution. Height This is the height of the resolution for the bitmap that will be created. By default, it is set to the same height as the scene resolution. Resolution Factor This is the size of the bitmap resolution in relation to the scene resolution. If you increase the percentage, the width and height fields will increase accordingly. If you plan to animate the camera and zoom into your background, you will need to set a higher resolution so that the smaller area in which you will zoom will be 100% of the scene resolution. In the Timeline view, select the drawing whose resolution you want to change. NOTE: Note that the drawing can be enlarged slightly and retain its original look, but you may lose quality if you enlarge it too much. Pixels are created and a smoothing pass is applied. You should set your resolution before drawing. If you need to change the resolution of a drawing to be larger than the one set in the Scene Settings dialog box, create an empty drawing first and then follow this procedure. The Change Bitmap Drawing Resolution window opens. When this option is selected, the existing bitmap image is modified to match the new resolution. If the width and height are increased, more pixels will be created to enlarge the image. Visually, the existing artwork will look the same, maybe a little bit smoothed out, but the size will look the same. When this option is deselected, the artwork is not modified. Only the reference grid is resized. 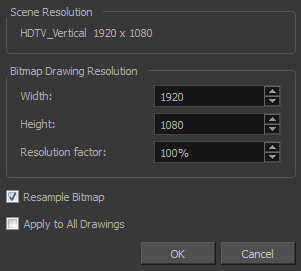 If the scene resolution is 1920 x 1080 and you reduce the bitmap resolution to 960 x 540, the image will be scaled up to twice the size of the scene. Apply to All Drawings The modified settings are applied to all drawings in the drawing layer for a given art layer. If the Apply to Line Art and Colour Art option is enabled, it will then be applied to all bitmap art layers.